2. Place paper baking cups in muffin pans (Optional: coat with cooking spray); spoon batter evenly into baking cups, filling each two-thirds full. 3. Bake at 350° for 25 minutes or until a wooden pick inserted in center comes out clean (35 minutes for King Muffin pans). 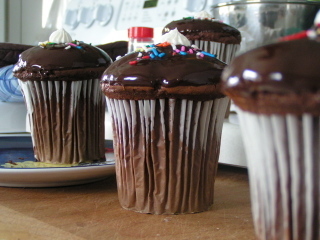 Cool in pans on wire racks 10 minutes; remove cupcakes from pans to wire racks, and cool 1 hour or until completely cool. Stores well in the refrigerator. 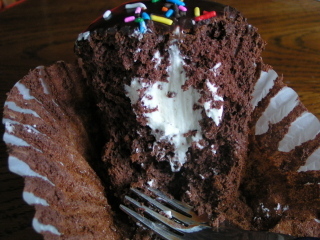 Put the whipped icing in a cake bag fitted with a large hole tip. 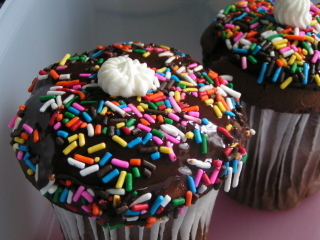 Poke the tip in the top of the ganache-iced cupcake and fill to the top of the cupcake. 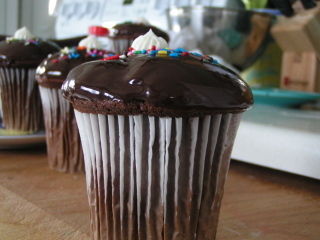 Dip the top of the cupcake in the Ganache. 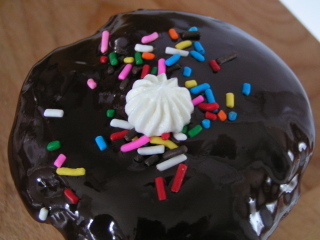 Add a whipped cream blob on the top. Sprinkle with Jimmies. Beautiful! I'm sure they tasted as good as they look!!! That looks so tasty! I haven't seen those pans yet.... I think I need one now!